Recently I was looking at Music Videos on YouTube when I found some videos by Adele, a singer whom I only recently discovered sings several songs that I like. I watched the video and happened to glance through the comments. There were a couple of positive and negative ones, after all, not everyone likes the same music. Then I found the unacceptable; "she's fat", followed by a few cries of dissent then a whole lot more "trolls" repeating the mantra. It's reading comments like this which really makes me despair for the future of the human race. We think that we're so far evolved from the haters of the 1940s but in truth we're not. We're every bit as judgemental and unaccepting as those we strive to distance ourselves from. It didn't help that shortly afterwards, there was some kind of US political debate about an overweight politician and then our local radio station here in Sydney, Australia started having a discussion about why "fat" mothers were not acceptable parents. So much of our bodies is determined by our own particular genetic heritage. You'll find that families have major similarities not only in facial components but in general body shape as well. You'll discover that twins separated at birth grow into the same sorts of people even though they live in entirely different circumstances. You'll find thin people who eat more and exercise less than many "bigger" people so what gives them the right to be judgemental? Getting the "normal" body shape is the luck of the draw. Why do these so-called "winners" feel that they have the right to pass judgement upon the "losers"? So, the real question is why am I talking about weight issues on my Aspergers Autism blog? Well, it's because there's very little difference between the two when it comes to the concept of "demonizing the genetically different". Like "bigger" people, those with autism didn't choose to be the way they are. Many people with autism are fighting their condition, trying to pretend to be "normal" as a way of fitting in - this pretence is no different to trying "diet-after-diet" as a means of "becoming" socially acceptable. Again, similarly, there's a shark-pool of quacks, offering expensive, ineffective and dangerous treatments -- and then there's bullying and stigmatizing. There's the social pressure to conform. Hand-in-hand with that pressure of course comes depression, torture and at its worst, suicide. Many people with weight issues go through some very dark times indeed, as do those on the spectrum when bullied. While others comment, laugh and point, they smile weakly and try to pass off the taunting which does permanent psychological damage. Friendships are damaged when "friends" turn for no apparent reason and anger often ensues. Why are we so quick to judge when a bigger person lashes out at their bullies? Why do schools place the blame on our autistic kids for doing the same? The fact that many people who are "bigger" are that way because of genetics rather than lifestyle choices is not well understood by the general public. This is the same as misunderstanding autism as "having been dropped on your head". Muscle-brained cures for weight include suggestions to not be so lazy and to stop eating - how different is that from the suggestion that people with social difficulties simply "get over it". There are drawbacks to the condition. Many tables and chairs in public areas are designed for "normal" people, just as our classes in school and our noisy shops are "designed" for those without sensory difficulties. I could probably go on forever but I think I've made my point. Acceptance isn't about "tolerating" a particular subset of people because you think they deserve your sympathy. True acceptance is the understanding that in humans, there is no such thing as "normal", there is only diversity. Everyone has things they do well and things they do badly. Everyone has feelings and everyone has the right to be treated as an equal without predjudice or judgement. It's ok to like or dislike someone's work but if you feel that you need to make negative comments about their person, then clearly YOU have an issue with tolerance and with not knowing when to simply "shut up". It's my hope that one day we'll throw off our human shackles and leave our 1940s selves behind but until then, at least we can all TRY to be accepting. So absolutely dead on!! I have had this exact thought in recent years. To many uncontrollable traits rate the "normal" status, and people take credit for what they had little control over. I am afraid it is like trying to teach a child that the card game "war" is all luck, no skill, they just don't get it. 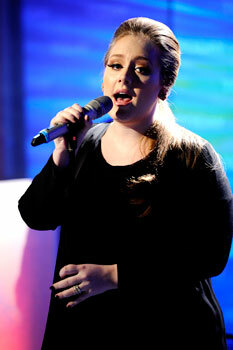 Getting on the internet and randomly calling Adele (or anyone else) fat is just wrong. There's no point in that at all, and it's purely critical and judgmental. Yet, we don't want to go too far in the opposite direction and make the weight issue purely one of cosmetic concerns, or make it taboo to mention it because it might make someone feel bad. There are real concerns about the fact that obesity rates have risen exponentially over the past few decades. The U.S. is in a health crisis; we have children on medications previously only seen in middle-aged adults. I think, as a society, we need to be more supportive and less judgmental, but supportive means honesty and the willingness to encourage healthier habits. Sadly, there are too many people who believe that shaming and condemning can lead to positive change. That does not happen. And it gets even worse, if you live in a small town with small minded people within its boundaries. I hate Oswestry. I hate everything that it encompasses. This singer looks very darkly attractive. And I haven't even heard her music yet. Sometimes you can go on first impressions alone. Just like a pair of black shiny shoes, that a female wears. If they are very shiny. Then she'll be a tidy person. Some of the trolls, bullies, and jerks seem to have very rigid views of the world, in which everything is either The One Way to Be Good or 100% Bad, instead of having any flexibility and respecting that other people's feelings may be different from their own. No wonder they condemn Adele for not being just like the other people they respect and don't care about what other people like Adele think. I don't believe that fat people are genetically predisposed to become fat. Sure, some people gain weight easily and some people can be thin gluttons. But when it comes down to it, I believe the vast majority of overweight people have the capability to lose weight. There are of course exceptions where people have actual medical conditions, but they are rare. People on the autism spectrum can never lose their autism, they can only learn to handle it better. On the issue of acceptance however, I agree. People from all races, genders, sexualities, ages, countries and religions have one thing in common. They’re unique. A few years ago, I would have agreed with you. In the last couple of years though, I've seen enough evidence to support the idea that genetics plays a much larger part in body shape than previously anticipated. Yes, fat people can become thin - if you starve them. Thin people can become fat if you force-feed them but if people are left to their own devices, they seem to follow a basic genetic pattern. I have never met a 'normal' person in my 40 years. Whoever this normal person is they must be very lonely. Whether its a weight issue, mental illness, personality trait, social circumstances, disability, physical attribute or whatever, every person has their 'stuff' to deal with and its all relative. I generally think bullying occurs to take the heat off the bully for whatever problem they are dealing with at the time...tge 'get them before they get me' mentality. I'm not sure why it matters whether someone's weight is genetic or whether they chose to be that way. Regardless of whether they can't help it, or whether they are happy the way they are, or simply don't see enough value in losing weight, I don't see why anyone else should be judgemental about it. Why is it an issue for anyone but the person themselves? It just seems to be a way that people try to make themselves feel better by putting other people down.